Soniccouture breathe new life into some classic drum sounds. The world of desktop music technology is not short of classic drum machines re-created as virtual instruments. The fact that Soniccouture’s Electro-Acoustic is built upon some very detailed sampling of 15 vintage hardware drum machines might not, therefore, instantly pique your interest. However, Soniccouture have added a combination of sound design and beat creation tools that make Electro-Acoustic considerably more than just another vintage drum sample collection. 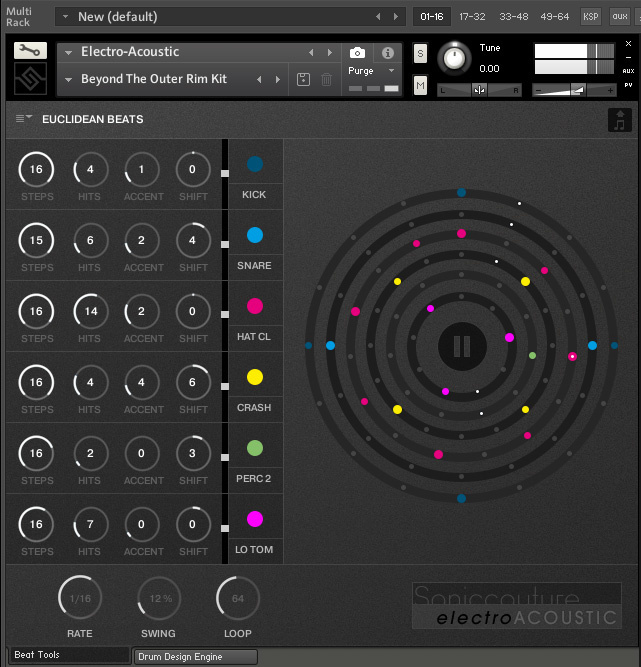 Electro-Acoustic is a Kontakt-based instrument and is presented via a slick, two-page front-end. 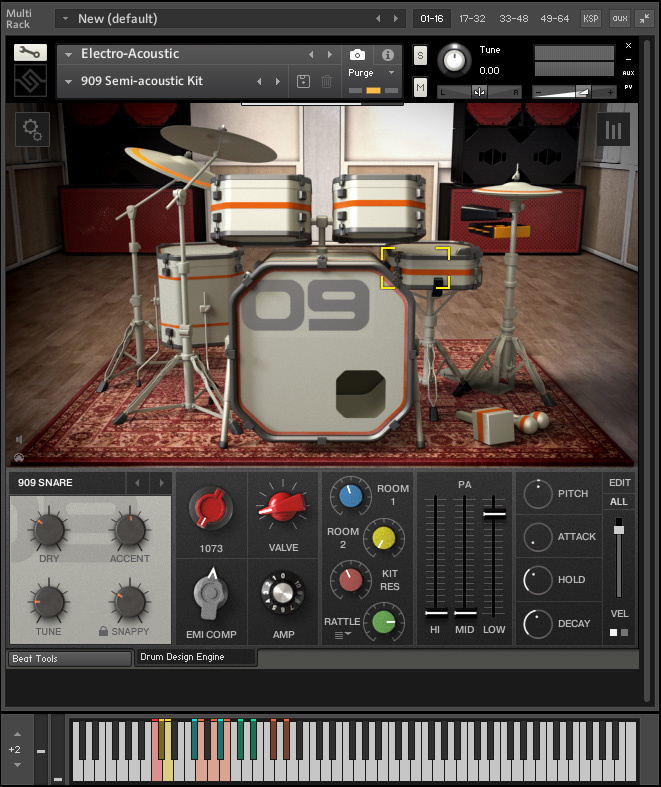 The Drum Design Engine is where you can load and then tweak the sounds to customise your own kit, while the Beat Tools page offers three different approaches to creating drum patterns. If you do want to work with just the original sounds of the various classic drum machines that have been carefully sampled then you most certainly can. One of the four preset categories provides ‘Drum Machines Dry’ patches for all 15 of the sampled instruments and very good they sound too. The slightly cartoon-styled drum kit graphic can be used to select an individual kit piece and, as you do so, the bottom-left section of the Drum Design Engine page will change its contents to reflect that selection. Interestingly, the controls shown here mimic what is available on the original hardware and as you change the settings you’re also changing the underlying samples used. Yes, Soniccouture have sampled every kit piece of all 15 drum machines at every combination of available settings and with five round-robins for each hit. That’s a lot of sampling; there is a very comprehensive sample library at the heart of this instrument. While the dry presets faithfully reproduce the original drum machine sounds, the ‘acoustic’ element of the library’s title is derived from a further collection of samples. The sound of each kit has also been captured through a combination of 11 other routes. This includes an overdriven Neve 1073 preamp, an EMI TG12345 compressor, a Rooster valve preamp and a miked up Ampeg bass cabinet. In addition, two different stereo ‘room’ mic recordings allow you to blend in the sorts of ‘room ambience’ generally associated with acoustic drum kit recording. The ‘dry’ presets give you the pure sound of the 15 original machines in all their glory.Things didn’t stop there though. ‘Resonance’ recordings were made by feeding the drum sounds to a speaker placed next to a stack of acoustic toms. A set of ‘rattle’ samples were recorded in a similar fashion and based on various other studio items vibrating (for example, a window and a full acoustic drum kit). Finally, the samples were fed through a full PA and separate recordings made of the low-, mid- and high-frequency elements (the latter two in stereo). These 11 additional elements can be blended with (or replace) the dry samples using the respective ‘analogue-styled’ controls that occupy the centre of the Drum Design Engine’s lower panel. Usefully, you can tweak these controls for an individual kit piece or for all the kit pieces simultaneously. The range of options here is impressive and each channel brings it’s own particular character to the sound. 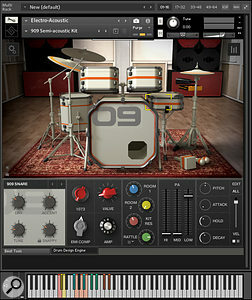 Further sound-shaping options are provided by the Kontakt-based ADSR and filter options for each drum in the right-most section of this panel. If all the sampling described above sounds like (a) a labour of love and (b) just slightly bonkers, then maybe it is, but I have to say that the results are absolutely fabulous. This is ably illustrated by the three other categories of presets. The sheer range of sounds that can be conjured from Electro-Acoustic is staggering. There is plenty in the supplied presets to explore, but if you like to design your own drum sounds, then look forward to some happy hours. Variety aside, what I found really impressive was just how much ‘life’ the various additional studio samples added to the raw sounds. Electro-Acoustic offers attitude and ambience in spades, making something electronic sound much more ‘acoustic’. And, boy, this instrument can really get your speaker cones flapping; dial in some PA ‘low’ and feel the air move. Use with caution! 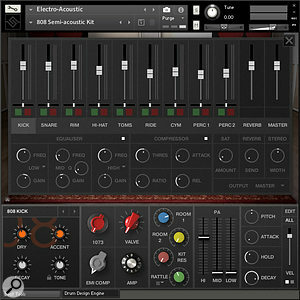 As well as the dry sounds and the 11 additional sample-based channels, Electro-Acoustic’s mixer offers further sound-shaping possibilities for each channel, plus a global reverb and master channel.The final element of the sound design is provided by Electro-Acoustic’s Mixer options (accessed via the button located top-right of the Drum Design Engine). Each channel offers level, pan, compression, EQ, saturation, reverb and stereo-width. There is also a master channel with its own compressor, EQ, tape saturation and limiter, and a reverb effect. All of these are built from Kontakt’s own built-in effects options and all do a very good job. If (like me) your creativity needs all the help it can get when it comes to drum pattern creation, then the three different options for creating new drum patterns on the Beat Tools page — Beat Shifter, Euclidean Beats and Poly Beats — are going to be of considerable interest. Beat Shifter provides what, at first glance, looks like a conventional, six-lane pattern grid with a maximum 16-step length. However, for each drum lane, you also get the Shift, Step, Direction, Random and Chance sliders. Random adds small amounts of velocity variation while Chance allows you to control the likelihood that each hit will play (or not) during each playback cycle. Further variety is added with the Shift fader. This controls the likelihood that the lane’s pattern of hits will be shifted along the timeline as playback cycles and, when set to a non-zero value, the Step value then controls how many steps the pattern is shifted by (the default is 1). The Direction fader influences whether the shift is forwards or backwards. The end result can be quite magical as your starting point pattern can gradually evolve into something very different. This can be limited to just one or two lanes or used on all six. And, as the pattern controls (located bottom-left) allow you to ‘freeze’ the pattern if you suddenly hear something you like, ‘store’ the current pattern, save the pattern to disk, or drag the pattern to your desktop or DAW as a MIDI file, the Beat Shifter feature can be a great way to kick start some new drum pattern ideas. 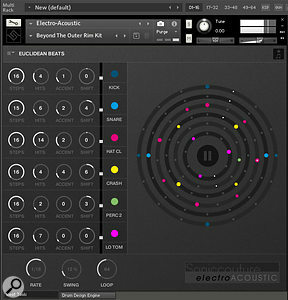 The Euclidean Beats tool provides a colourful, but also creative, tool for creating new patterns.In Euclidean Beats mode, you can set the number of steps used for each drum sound (up to a maximum of 16) and then specify how many hits are used within those steps (the hits are spaced evenly and this is clearly illustrated by the colourful circular graphic). You can also specify the number of beats to be accented and shift the beat pattern forwards/backwards relative to the other lanes. Again, you can drag and drop patterns you like to your DAW/desktop. For even more fun, linking these various controls to a hardware MIDI controller surface provides a really creative way of improvising with your beat, either in the studio or as a live performance. And if all that’s not enough, then there’s Poly Beats. Here, the grid-based pattern editor can have different step counts specified for each lane (that is, the bar is divided into different step lengths for each drum sound), creating all sorts of interesting rhythmic effects. The mode also includes various ways to generate random patterns for a specific lane (or lanes) and you can just keep hitting the Randomise button until something funky drops into your lap... and then drag it off to your sequencer. Providing you lock a couple of key lanes (using the padlock icons) to give the groove some consistency, this is another great way to generate new beats with minimal effort. In use, I have to say that I found Electro-Acoustic a joy. This virtual instrument does an incredible job of taking what can be a pretty sterile sound source — a drum machine — and turning it into something that feels much more ‘alive’. The sound design options are easy to use and very flexible. However, for me at least, it was the option to blend in just enough room or resonance or rattle to transform the (already good) drum machine samples into something that felt like a hybrid of electronic and acoustic that was most impressive. The results can be both organic and inspiring. That said, if you simply want to make the walls shake with a super-sub kick, Electro-Acoustic can do that too. I was equally taken with the beat creation options. For someone who finds the whole process of creating drum patterns from scratch difficult and somewhat tedious, Electro-Acoustic’s Beat Tools will be a significant bonus on top of the sounds themselves. I lost rather too many hours in the course of writing this review dragging and dropping new beats into Cubase — a process that works seamlessly, by the way — for later development. My only other comment would be that some of the kits can get a bit greedy in terms of RAM usage (for example, the 808 which, if you load all the samples, clocks in at over 1.6GB). Thankfully, Kontakt’s usual ‘purge’ features are available and Electro-Acoustic offers its own options for streamlining system demands. Electro-Acoustic is a really interesting and creative product. While the price perhaps puts it beyond the ‘casual purchase’ category for many, it is undoubtedly very good value. 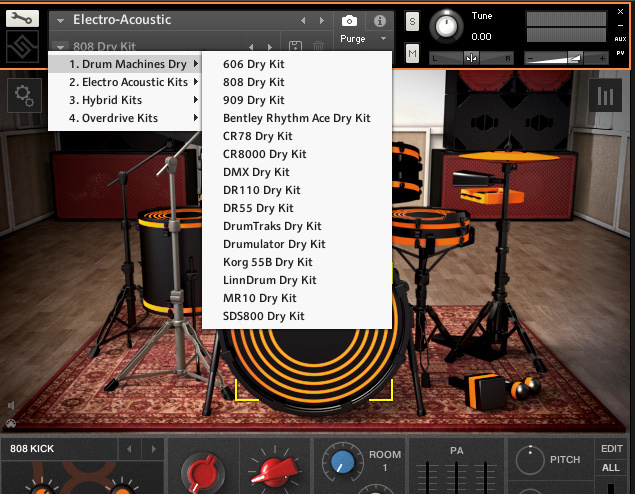 There are lots of very excellent virtual electronic drum instruments out there already so, for some, the raw sounds might feel like duplication. However, the hugely flexible sound design options offered by Electro-Acoustic certainly make it worth some serious attention, and the beat creation options are a real bonus. 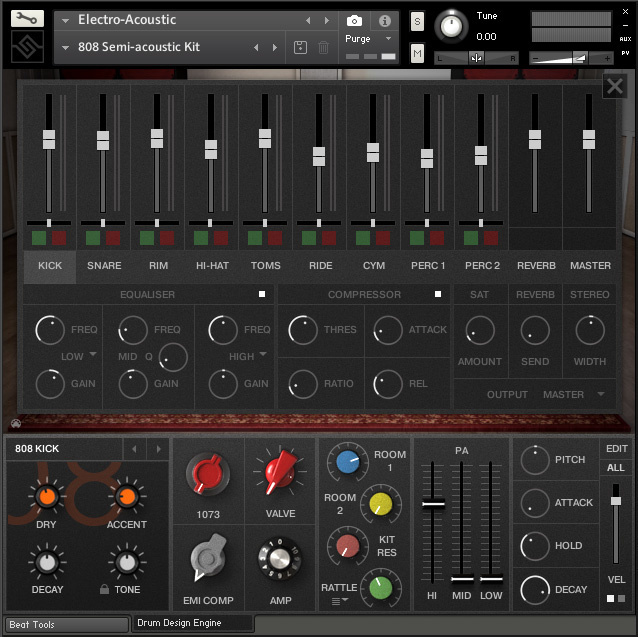 For those that like the idea of electronic drum sounds that can breathe like an acoustic kit, and pattern creation tools that can inspire, then Electro-Acoustic is a bit of a gem. There is no shortage of choice when it comes to virtual drum machines. For example, software such as Arturia’s Spark 2, NI’s Battery 4 or FXpansion’s Geist 2 all deliver impressive electronic drums in a variety of different ways. However, I’m not aware of any product that really offers a similar palette of options to Electro-Acoustic. Perhaps it is not ‘unique’ in all respects, but it is certainly a product with unique elements, and competitively priced considering what is on offer. Detailed sampling of some classic drum machines. Almost limitless sound design options. Electronic drum sounds that can be made to breathe. Can be a bit demanding on RAM with all those samples. At this price, nothing else. Don’t fall into the trap of thinking Electro-Acoustic is simply another virtual vintage drum machine collection. It is, but it’s also much more, and the drum sound design and pattern creation tools make for a very impressive all-round package. Apple iMac running OS 10.12.5, 3.5 GHz Intel Core i7, 32GB RAM.